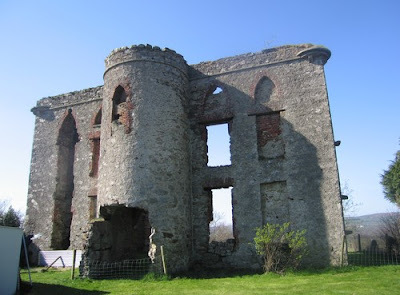 Dunnamanagh Castle, Donemana, County Tyrone, is an abandoned three-storey, three-bay Georgian-Gothic dwelling, believed to date from the late 18th century. Old maps of 1813 describe it as ruinous, though it isn't mentioned thus on maps of 1905. In 1828-40 it was listed as an "old castle and tower", providing dimensions and declaring that the castle was uninhabitable. "The greater part of this parish was granted by JAMES I to Sir John Drummond who founded the town of Dunnamanagh and built a bawn 109 feet square, no part of which remains as the bawn was removed some years since and the modern building called the Castle was erected on its site." Another publication of 1666-78 described Downemanagh [sic] as the property of "Sir William Hamilton, of Elston [Manor Elieston], Knight and Protestant." His descendant, Sir John Stuart Hamilton, 1st Baronet and MP for Strabane, is mentioned several times in late 18th-century correspondence between the 1st Marquess of Abercorn and his agent, James Hamilton, as being in residence at Dunnamanagh Castle or Earlsgift. James Hamilton wrote in 1793, that "Sir John Hamilton’s brother died last week at Donemanagh, his weight 42 stones ... it took 16 planks to make his coffin…"
"Your Lordship will be astonished when I tell you that Sir John Hamilton has subscribed his entire pension £300 a year towards the war [and] is living the life of a hermit at Donemanagh". James Hamilton’s letters recount Sir John Hamilton's death in 1802 and speculate that the baronetcy would expire following the death of "Young Sir John". He added: "If I can credit his surgeon and housekeeper he will never leave an heir." Sir John Hamilton, the 2nd and last Baronet, died in 1818. Hamilton, Lord Abercorn's agent, suggested that his lordship endeavour to obtain the reversion of the second and last Baronet's estates.